Much of what we do in and around the Chesapeake Bay has an impact on life within the Bay. Pollutants from boats, sewage treatment plants, industrial uses, septic tanks, and runoff from land all add to the problem. Many governments, organizations, and individuals throughout the Chesapeake Bay watershed have joined together in an effort to clean up and restore the Bay. In the mid-1970’s, U.S. Senator Charles Mathias (R-MD) saw the Bay of his youth in distress and began a fact-finding tour of marine science institutions around the Bay to try to understand the Chesapeake’s decline. His efforts eventually resulted in formation of the Chesapeake Bay Program – a multi-jurisdictional partnership that’s working successfully to restore and protect the Bay and its resources. The Chesapeake Bay Program is a regional partnership that has directed the restoration of the Chesapeake Bay since the signing of the Chesapeake Bay Agreement in 1983. The Chesapeake Bay Program partners include the states of Maryland, Pennsylvania, and Virginia, the District of Columbia, the Chesapeake Bay Commission, and the US Environmental Protection Agency. Since its inception in 1983, the Bay Program’s highest priority has been the restoration of the Bay’s living resources- its finfish, shellfish, Bay grasses, and other aquatic life and wildlife. Improvements include fisheries and habitat restoration, recovery of Bay grasses, nutrient and toxic reductions, and significant advances in estuarine science. Progress made in the effort to restore the Bay is reported by the Chesapeake Bay Program in the State of the Chesapeake Bay reports. These annual reports describes the health of the Chesapeake Bay, it’s tributaries, habitats, and wildlife. 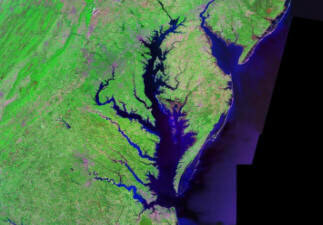 The most significant threat to the health of the Chesapeake Bay is an over abundance of nutrients. When present in excessive amounts, nutrients trigger algae blooms. The algae blocks sunlight from reaching below the water surface and aquatic plants suffer. Also, when the algae dies and decomposes, the decomposition process can use up oxygen in the water to the point that there is not enough for other aquatic life to survive. The Bay Journal. The Alliance for the Chesapeake Bay’s informative newspaper. The Maryland Sea Grant. Marine research and education with a special focus on the Chesapeake Bay. The US Fish and Wildlife Service’s Chesapeake Bay Field Office. Maryland Department of Natural Resources. Maryland’s Chesapeake Bay programs. Maryland’s Clean Marina Initiative. See which Maryland marinas meet the guidelines of this program. Osprey Cam. Live webcam focused on an Osprey nest in Blackwater National Wildlife Refuge. Eyes on the Bay. Real time water and habitat quality monitoring data.